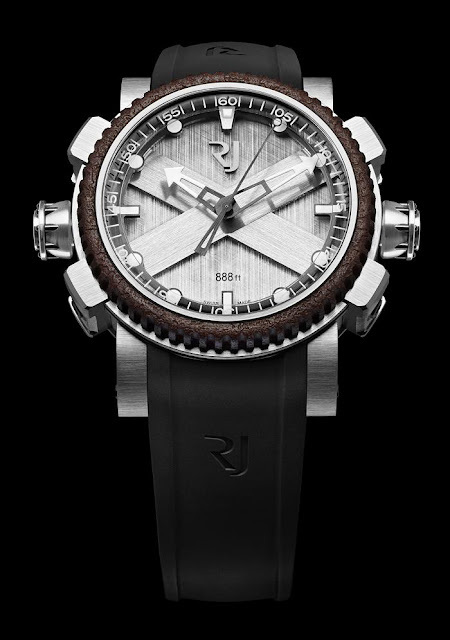 Romain Jerome’s Titanic-DNA collection, which successfully captured the imagination for exploring the ocean depths in dashing steampunk style, now introduces its first diver’s watch capable of safely accompanying explorers into the depths. 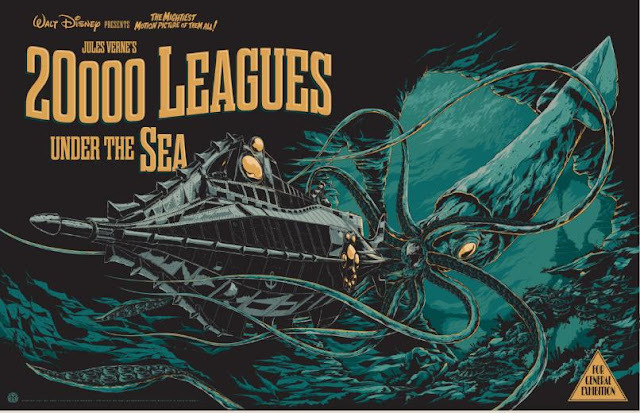 Named The Octopus after the ocean giant that became a powerful symbol in Jules Verne’s famous novel Twenty Thousand Leagues under the Sea, the watch features two crowns, one at 9 o’clock to set the watch and a second one at 3 o’clock for the elapsed time controller. The Octopus comes equipped with an exclusive internal unidirectional rotating sapphire bezel system featuring engraved five-minute graduations. The chapter ring’s markers are enhanced with Superluminova “blue emission“ in order to ensure maximum visibility underwater, and the hands are also luminescent. Every detail of the watch is said to reflect the number eight, a hint to the number of legs of the Octopus and a lucky number in some cultures. There are eight octagon head screws on the 45mm case as well as on the back of the watch which is stamped by a hand-engraved octopus. The two screw-locked crowns are adorned with eight rivets and guarantee a water resistance of 888 feet (270 metres) for each model limited to 888 pieces. As with other watches in the Titanic-DNA collection, the notched bezel contains oxidised and stabilised steel taken directly from the Titanic. The dial carries the signature large X-shaped intersection found on dials in the RJ-Romain Jerome collections, with its carefully satin-brushed traverse struts and paws. For underwater sports devotees, it's the cross of St. Andrew’s flag (without the blue colour) which indicates the presence of divers practicing. Another detail of this watch full of references, the interior of the black rubber strap features suction cups rather like the ones found on the tentacles of an octopus. 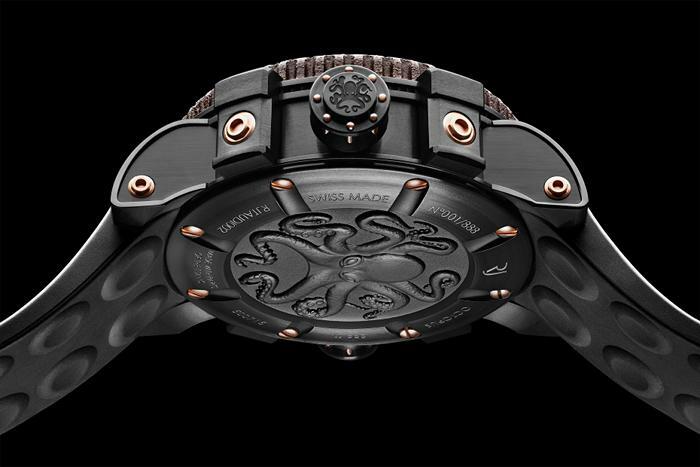 The rugged appearance of the Octopus comes in three different versions: steel, black PVD-coated steel and black PVD-coated steel with red gold. The watch is already on sale at all RJ-Romain Jerome authorised retailers.